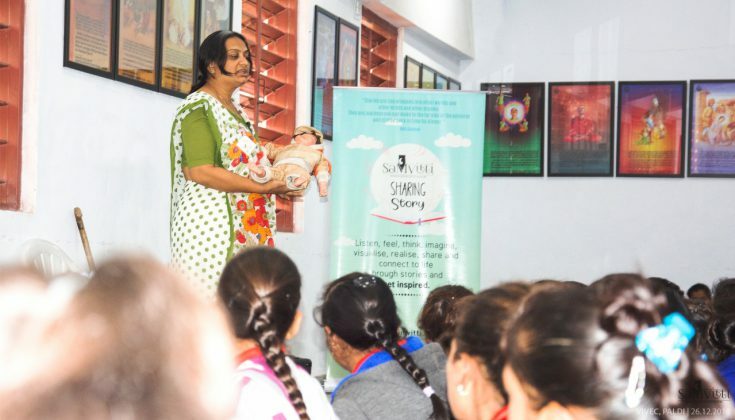 Continue their legacy to spread awareness in the society SaMvitti ‘Sharing Story’ continues to be a strong medium to get connected with the people. 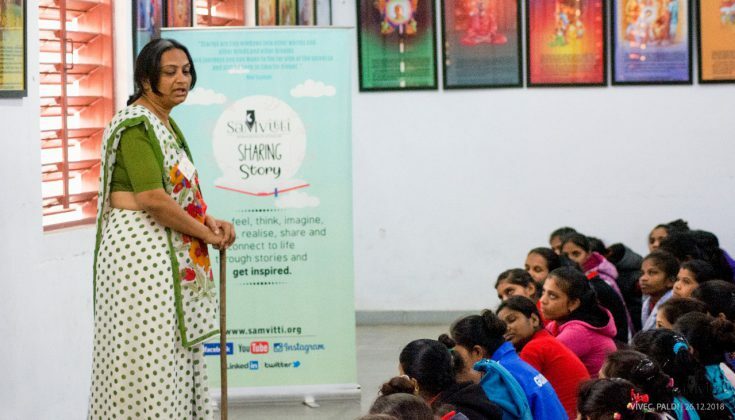 Taking references from the inspirational stories the SahiytaMitras indulge themselves in the process to spread happiness and make participants learn from the stories. Recently SahityaMitra Mital Shah performed a monologue on the story ‘Bhikharin’ by Ravindranath Tagore for tribal girls of Shroffs Foundation Trust’s Vivekanand Institute of Vocational & Entrepreneurial Competence in Paldi. The story revolves around a poor woman-beggar who used to beg outside a temple for her livelihood. This woman-beggar with no known family one day finds an abandoned child outside the temple and she decides to keep the child with her. Now the child is her everything. Her only goal is to feed the child, talk to the child and give it the best up-bringing as possible. 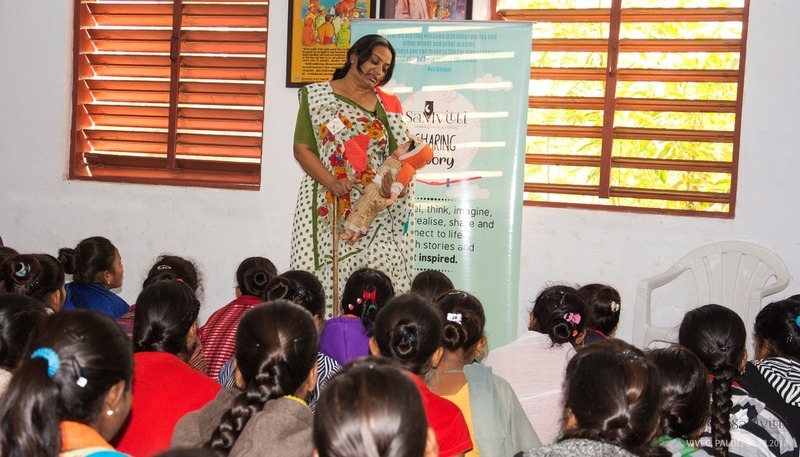 She starts depositing some amount of her savings with the Sheth so that she can give that child good education in the future. One day suddenly the child falls ill. She goes and brings medicine from the doctor and gives it to the child but there is no improvement. So she decides to take the child to a better doctor in the city. For that, she goes to take her money from the Sheth. But the Sheth goes back from his word and refuses to give her the money. The woman-beggar tries to convince the Sheth by explaining about her child’s illness but he insults her and asks his servant to throw her out of the house. Finally, the tired and exhausted woman-beggar takes the child and goes to the Sheth’s house. As she reaches the Sheth’s home, his wife comes out and as she sees the child she realises that it is her child who had got lost in his childhood. So, she sobs and requests the woman-beggar to return her child. The woman-beggar, though poor but rich at heart, gives her piece-of-heart, the child, to the Sheth’s wife. On one side, the fever of the child is continuously increasing and even in his sleep he is thinking about his poor mother. No medicine could help him get well so, at the end the Sheth goes to meet the woman-beggar and begs her to come to his home for the sake of his child’s health and the woman-beggar, without the slightest delay goes along with him. The moment she reaches and lifts the child, because of her motherly touch, the child opens his eyes and starts showing signs of recovery. The Sheth then realises his mistake and requests the woman-beggar to stay in his house. But, because of her self-respect, she denies to stay at the Sheth’s house and returns back to her home. SahiytaMitra finished her monologue when the woman-beggar helped the Sheth in-order to recover the child’s health. At the end of the monologue a question was raised that what would have happened to the Bhikharin after she gave away the child. Participants shared their various assumptions of which one of it was that she must have been asked to stay at the Sheth’s home. Participants were curious to know whether she agreed or not. In discussion they reached to a clarity that she would have denied to stay because of her self-respect. At the end the participants discussed the persona of the woman-beggar. They also realized the power of motherhood and how it affects the child.